Hi everyone it’s another week of The Feast! 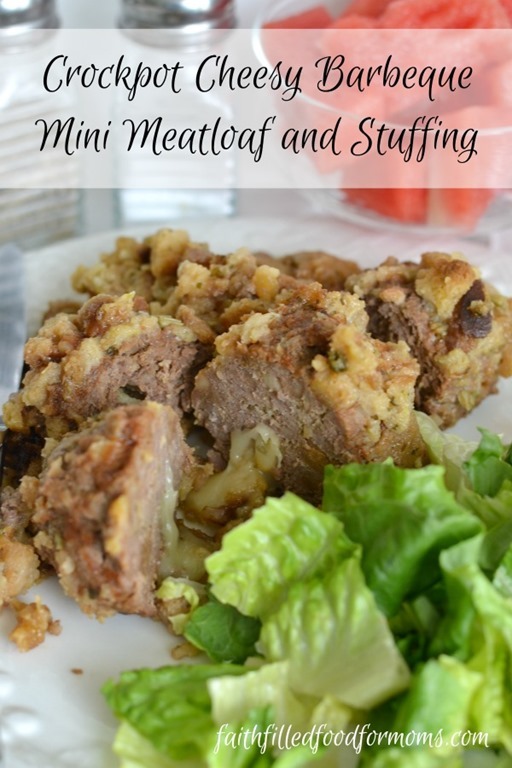 First up is this deelish Crockpot Cheesy Barbecue Mini Meatloaf and Stuffing I made this week. 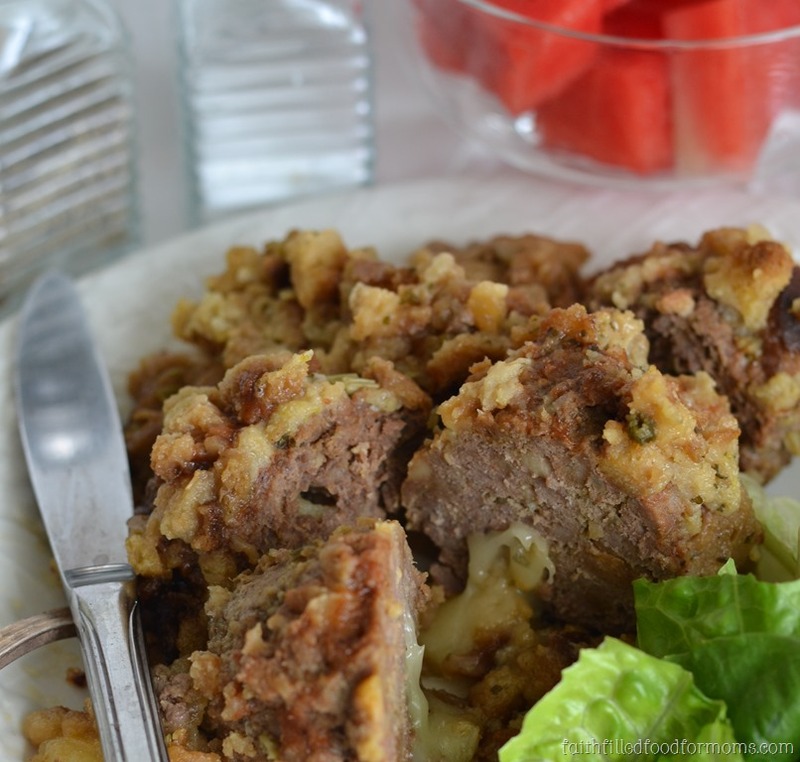 I have to tell you NOBODY in my family likes meatloaf except my husband…but this meatloaf…was. a. HIT! I love making Easy Crockpot Dinner Recipes and this was super moist and flavorful. Adding the Stuffing made it somehow a perfect comfort food dinner. So I know it’s Summer and many are into salads and I’ve got some great summery recipes, but since we into LESS WORK AND MORE PLAY this summer…crockpot comfort food is on the menu at least once a week! I created this recipe with ground beef, but it could totally be made with ground turkey! 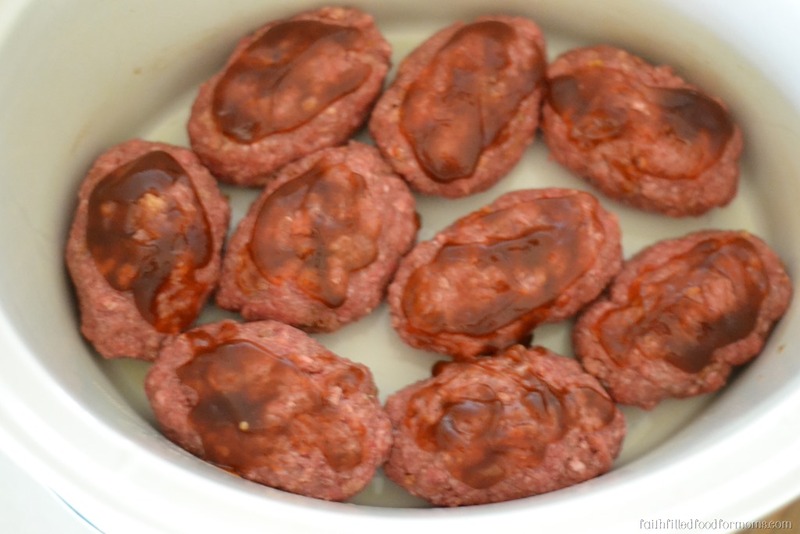 I buy ground beef in bulk and I’m always looking for ways to use it creatively. 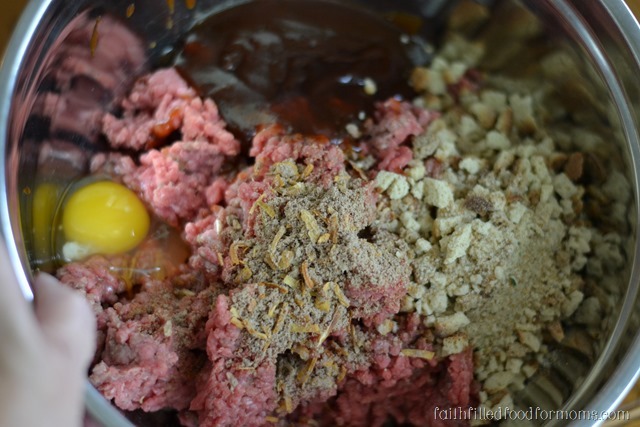 Mix together meat, 1/2 cup of barbeque sauce, soup mix, and 1 cup of DRY stuffing mix that has been coarsely crushed. You can crush stuffing by putting it into a baggie and using a rolling pin to crush. OR you can use a small food processer. Whatever works! 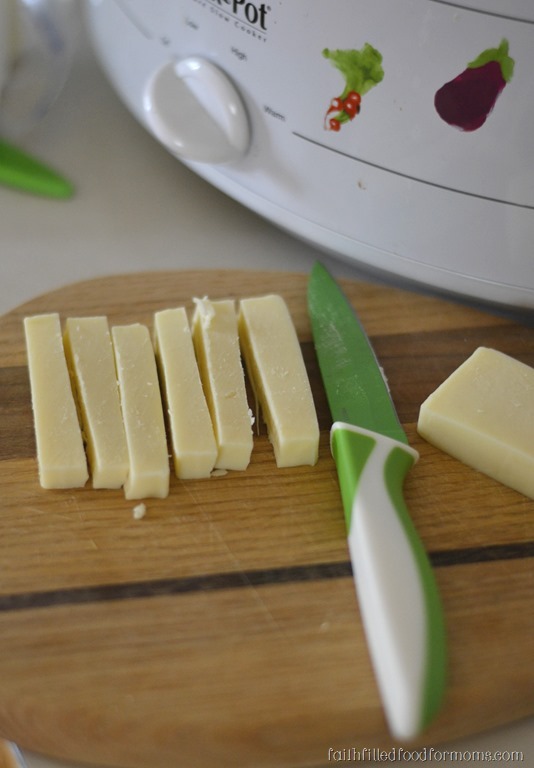 Cut your cheese into 3 inch slivers/fingers. By the way, if you don’t like Monterey Jack cheese…you an use another kind! 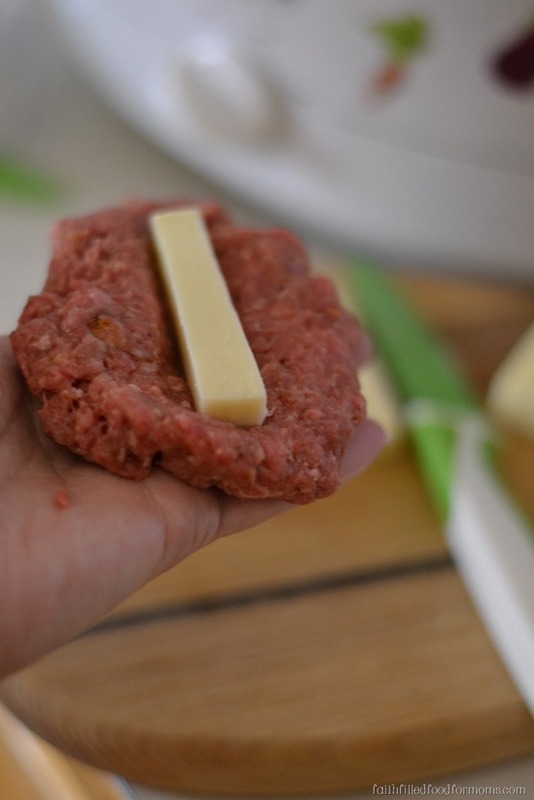 Place a sliver of cheese into the middle and fold meat around it. 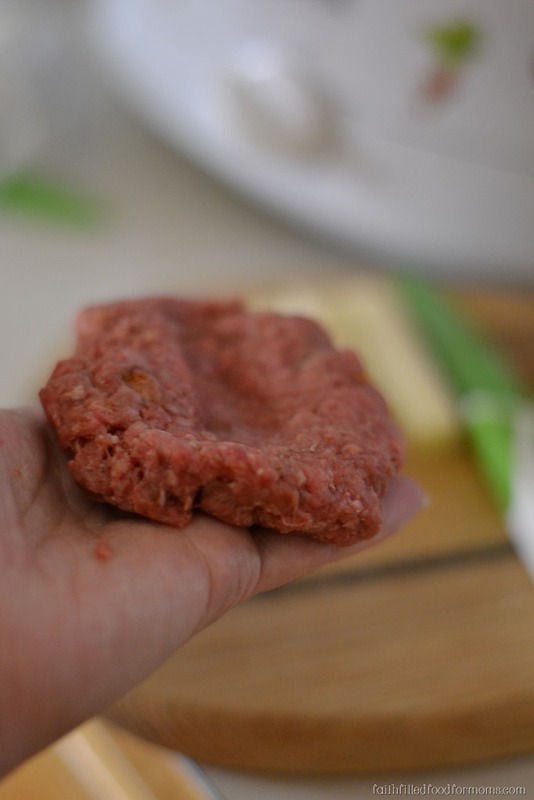 If you need a little more meat, simply grab a pinch off of another portion. Then place into your PRE SPRAYED Crockpot. I ALWAYS spray my crockpot with cooking spray. Crockpot cooking won’t be easy if you have to scrub forever to get it clean! Add a little Barbeque sauce on top of you mini meatloaf portions. Oh and by the way…I have so many little loaves because my daughter happened to stop by at dinner time, so I added a little more meat. You don’t have to boil water for this…simply Mix your stuffing with amount of water the package calls for. No need to wait until it is absorbed…it will become very moist in the crockpot. As a matter of fact if there is a little water left in bottom of bowl, poor into the crockpot. Double up this recipe or simply add more meat as I did for a couple extra meat loaves. Add a little Barbeque sauce on top of you mini meatloaf portions. Top with rest of dressing ~ You don’t have to boil water for this…simply Mix your stuffing with amount of water the package calls for. No need to wait until it is absorbed…it will become very moist in the crockpot. As a matter of fact if there is a little water left in bottom of bowl, poor into the crockpot. I’m mom to 4, Grannie to 15 and GG (great-grandma) to 8. I just signed up to your email. I am drooling over this recipe and that will be on the menu for tomorrow! I can hardly wait to try it. Thank you for sharing. Hi Anna! Congratulations on such a beeautiful family…what a blessing! I’m honored that you have signed up to be on the email list…This recipe is just so yummy…and easy…enjoy and thank you for stopping by! 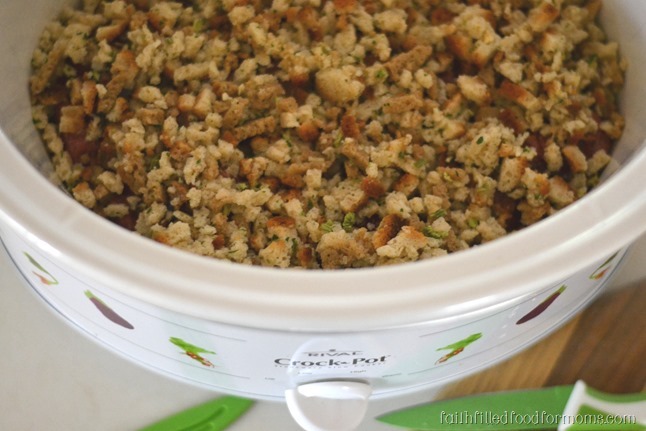 Can you use cornbread stuffing? Going to make these tomorrow for dinner! Hi Marissa! YES! You absolutely can! Enjoy and remember use as much or little BBQ sauce as your family likes for topping! I’d love to hear how your family likes it!